There is no doubt that IBM's Lotus Connections is a powerful and elegant social software platform. It takes new hardware, careful planning, training, learning new software, oh yeah - and some money to make a Connections implementation successful. For those of you who won't be going down the Connections road anytime soon you have other options when it comes to reaping the benefits of "social bookmarking". Social bookmarking is one of the core pillars of Connections. 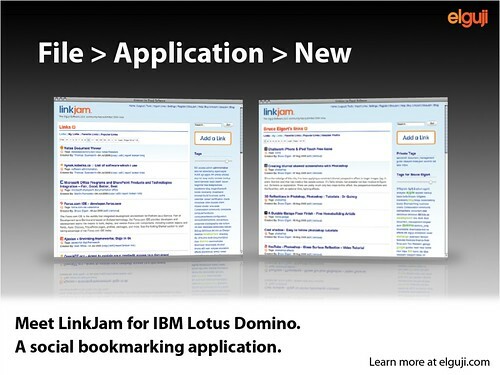 What if I told you that you can have social bookmarking up and running in your existing IBM Notes and Domino environment today. Installed, configured and ready to use all within 30 minutes. Interested? Read on. LinkJam is a Notes/Domino template that you can simply install from using the File > Application > New > LinkJam menu command. Once installed you will have a social bookmarking app installed on your Domino intranet and all you will need to do is to then fill in a few fields in the LinkJam Control Panel. LinkJam comes with a browser bookmarklet that you can add to your browser to quickly bookmark and site quickly and easily. You can even upload your browsers bookmarks. We also offer LinkJam with our Premier and Advanced versions of IdeaJam and IQJam. Learn more about LinkJam >. Clever Together is a business improvement agency that partners with Elguji Software - we generate collective insight and deliver informed action to accelerate value across the full business lifecycle. We believe that organisations can deliver more value, sooner, by making business decisions and taking actions that are informed by deep, collective insight. Until recently technological limitations and tradition have forced business leaders to rely on information generated by individuals or small groups – sourcing insight from large groups with diverse experience was expensive, time consuming and hard to coordinate. Today, Clever Together makes it possible to generate collective insight from staff, customers, suppliers and partners, in real time – providing deep engagement across traditional boundaries. By combining applied social media with focussed event facilitation, our approach offers leaders an unprecedented opportunity to take informed action across their whole improvement lifecycle. En-Masse Stakeholder Engagement - We are different from traditional advisory firms because of our ability to rapidly tap the collective wisdom and insight of your stakeholders. For a fraction of the cost of traditional stakeholder engagement techniques we are able to give you the information you need to make better decisions, underpinned by real stakeholder support. Whole Lifecycle - We are different from social engagement and media agencies because we are able to support your whole improvement lifecycle, from generating insight to planning action and realising the benefits. We’ll help you understand your challenges and facilitate the improvements you need in your organisation. Improvement From Within – We recognise that the best source of insight for your organisation is from the people you employ and those within your immediate network (customers, suppliers and partners). In this sense, our approach creates the environment for innovation and improvement from within your organisation and its networks. As facilitators we form an integral part of your internal improvement network, as opposed to providing external advice. We have built our business on a strong foundation of working in partnership with firms who recognise that our skills complement their offer to add increased value and improved outcomes for clients. Gain new customers – using your platform for client engagements where we feel you offer the best solution for the context at hand. creating additional USPs – an extra innovative edge within your proposals. Contact Clever Togethers's Robin Vickers for more information. Founded in 1994, the core competence of PAVONE lies in providing rock-solid workflow solutions across line-of-business processes. PAVONE elevates human workflow to a new level by offering a tight integration with Project Management, CRM, and Document Management applications. For over 16 years, PAVONE has satisfied customers with a palette of collaborative solutions. The PAVONE consulting teams are dedicated to customized business process optimization and system integration using the latest technologies. In the tradition of German engineering, PAVONE continuously updates and fine-tunes its products and solutions with the latest technologies. The PAVONE consulting services brings project experience that spans decades of technology innovation. PAVONE performs reliable work and provides professional support to customers in all project phases. Customers have benefited from PAVONE's services in over 2500 projects with 315,000 installations. Based in Paderborn, Germany, PAVONE has branch offices in England and the United States. PAVONE employs over 40 people at its offices in Paderborn and Boeblingen as well as at home offices throughout Germany. PAVONE an authorized Elguji Software Partner can assist you with evaluating and learning more about Elguji's products including IdeaJam, LinkJam and IQJam. Contact PAVONE's Ingo Erdmann for more information. 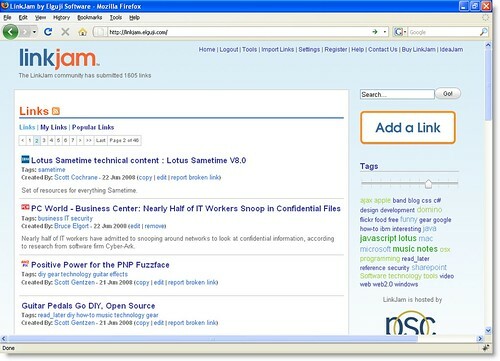 We are happy to announce that we will be offering LinkJam Express (hidden design) our social bookmarking software for IBM Lotus Domino for $1,995 (US) from November 12th, 2008 through January 22nd, 2009. This price is for a single server and includes one year of email support. Flexible software maintenance plans are also available at an extra charge. This special offers every Lotus Notes/Domino shop the opportunity to employ social bookmarking in their existing environment. You can have LinkJam installed and running within 15 minutes. To purchase your copy please contact our sales team. To learn more about LinkJam check out our tour videos at http://elguji.com/linkjamtour. Remember that this special ends on the last day of Lotusphere 2009 (January 22, 2009). Why use LinkJam in your company? Click the image to see a larger view. Our customers really like the widgets we have develped for IdeaJam and LinkJam. The "blog this" and sidebar widget for IdeaJam and the sidebar widget for LinkJam. We just realized that we forgot to tell you how to add the LinkJam sidebar widget on your blog. Cut and paste the code below and, if you want to show only your links change the word all to your name. I am happy to report that LinkJam is now gold! Read more about LinkJam on a story I wrote on vowe.net or here on the Elguji site. The Elguji website will be updated with LinkJam information later this week. LinkJam is scheduled to be released on Thursday, July 31, 2008. LinkJam will be offered at a discount to all IdeaJam customers. Contact our sales staff for more information. Well we're beavering away with the development of LinkJam. hopefully we'll be going into a beta state in the next few weeks. But I thought I'd update you with a few of the newer features that I've been putting in recently. Suggested Tags. Like IdeaJam we are really pushing tags with LinkJam so that as you post more links you can begin to build up a really good resource database of similar sites. To help with this, when you create a new link, if a link already exists for that domain then you'll be give a list of suggested tags to apply to your new link. That way you can benefit from the work that you and your colleagues have already put in. Private Links. You might also want to create links just for yourself so rather than having to maintain private links somewhere else, you can simply mark your new link as private. Then you and only you will be able to see it in the future. Importing Links. 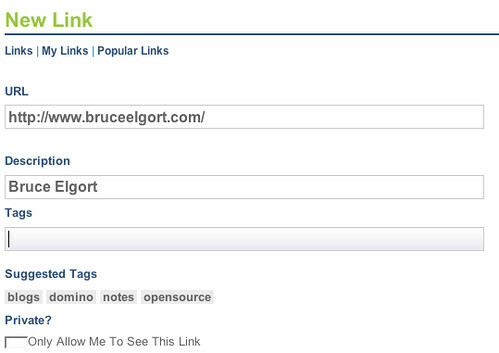 Bruce has already mentioned our import tool. So far we are supporting the importing of bookmarks from del.icio.us, Dogear, Firefox, Internet Explorer and Safari. If youd like to help us out we are trying to get as many links loaded up as possible, please feel free to send us your bookmarks file. There'll be a lot more news over the next few weeks as we get towards opening up the site for beta testing. IBM's Rational Software Division Chooses Elguji for their "Jazz Plan Jam"
Social in Business: What are we doing here anyway?